Nothing moves a woman’s heart more than chocolate. Maybe diamonds. But I can’t afford them, besides, diamonds in your blood stream can’t be good for you. So what is it about chocolate that is so attractive, maybe even addictive, to some women? Well, let’s start at the source. The cacao tree (yes, it is spelled correctly). 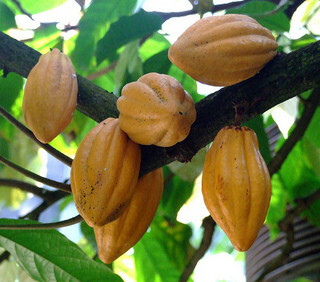 The cacao tree, Theobroma cacao, is a medium sized tree native to the tropical regions of Central and South America. The seed pods are used to make cocoa. Cocoa comes from cacao. There will be a quiz. Cacao is the unprocessed, raw form of the bean. Once it is processed, usually roasted and sweeteners added, it becomes cocoa. Cocoa is just the Anglicized wording of cacao. I don’t blame us one bit, you try saying “cacao” a few times aloud. You sound like a damned crow. Throw in some fats and sugar and you’ve got yourself a party. So now we’ve got chocolate. What’s going on in there? Well, we all know about caffeine, but there are about 300 or so other chemicals present in chocolate, too. That may sound like a lot, but most things from nature are like this, and 95% of these chemicals are present in really, really, small amounts. [So like my boy Nick Diaz says, “Don’t be scared homie.”] This Valentine’s Day I’m just going to concentrate on three: anandamide, theobromine, and phenethylamine. 1. Anandamide has a CB1 affinity about 8 times less than THC, about 80 nM versus 10 nM (smaller the better). 2. The amount of anandamide in chocolate ranges from 0.05-57 micrograms per gram of chocolate or cocoa. So we’ve got a weaker binding drug (albeit a full agonist) present in miniscule amounts. Not a good recipe for a drug, but a hell of a good tasting delivery system! But could someone feel the effects of anandamide in a THC like way? It’s definitely plausible, as people react differently to chocolate (and marijuana for that matter). What’s next? Theobromine. This is the drug/chemical/poison that makes dogs throw up after eating chocolate, and in some cases kill them. You’re probably wondering why theobromine is a (relatively) good thing in people. It has to do with how theobromine is metabolized in different species. In humans, the half-life (amount needed to clear half the drug from the body) is a few hours, in dogs it is almost 20 hours. Couple that with the dog having less mass and surface area, and you’ve got a recipe for white, frothy puke all over your rug. Enough of that, though. In humans, theobromine is funny in that it is a myocardial stimulant as well as a vasodilator – it increases the heart rate yet decreases blood pressure. Stimulating yet relaxing, sign me up! 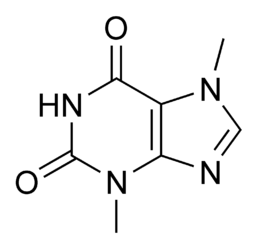 Theobromine has also been shown to be a fairly potent antitussive (cough reducing) agent, more powerful than even codeine (which helps you stop coughing, but has a nasty side-effect of stopping breathing, too). So now we’re cooking. Euphoria, stimulating, relaxing . . . but wait, there’s more! We can’t forget phenethylamine. Phenethylamine (or phenylethylamine) is always intruguing to me as it is the structural backbone to drugs you may have heard of: crystal meth (methamphetamine), ecstasy (MDMA), and “bath salts” (cathinones). Phenethylamine works by stimulating the release of norepinephrine and dopamine, neurotransmitters responsible for alertness, motivation, and reward. [Phenethylamine is not exclusive to just chocolate, as it is also common in many other high protein foods, such as soybeans, meats, eggs, and dairy products.] The downside is that phenethylamine is rapidly metabolized in the gut after ingestion, so not a lot is expected to reach the brain. But hey, given enough chocolate, who knows? The tally is in. Chocolate can provide you with a euphoric high, a stimulating relaxation, and an extra kick of motivation. Throw in the sugar to raise your loved one’s low blood sugar and everything is right as rain. So if you’ll excuse me, I’m off to buy 10 pounds of chocolate and a Barry White album for the better half. Happy Valentine’s Day! Tags: anandamide, chocolate, phenethylamine, theobromine. Bookmark the permalink. Sanskrit has never been dead. It’s just not a first language, except now in post-colonial nationalist India it is, sigh. I had to Wikipedia that one! And I misspelled it. Suggestions for an edit? Almost dead? Just omit the word dead?